This is an easy to use data tracking sheet tracks the Antecedent Behavior, and Consequence for special education teachers to use in their classroom's. Teachers are able to quickly data track student behavior throughout the day as it is happening. There isn't a long written narrative needed. 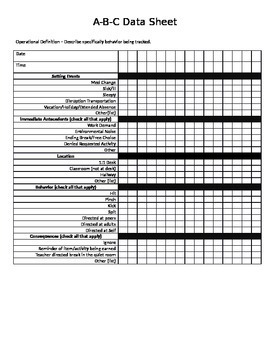 The sheet can be easily individualized for specific students in their classroom.